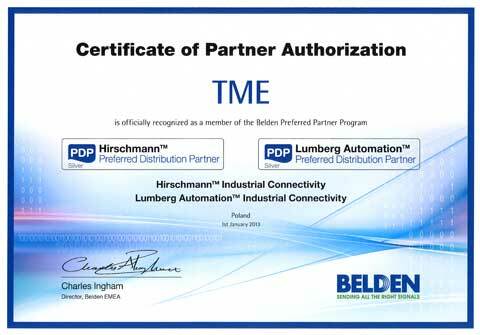 We are pleased to inform that TME, European supplier of electronics components, has received the status of Preferred Distribution Partner from cables and leads’ manufacturer – BELDEN company. This distinction also includes HIRSCHMANN and LUMBERG connections. 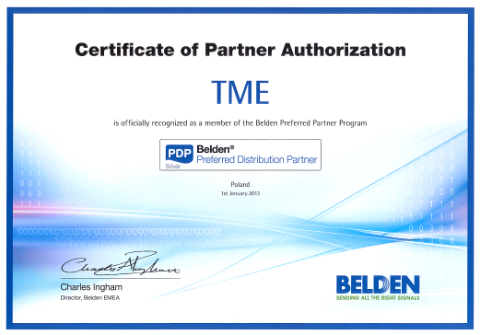 BELDEN, a world famous brand associated with high quality, developed a program of BELDEN Preferred Partner for its most promising distributors. TME, which is perceived as one of the best distribution companies in Polish and other markets, has been invited to this program, among others, due to great opportunities of development. We are looking forward to future cooperation.